The name is derived from the ancient Greek province of Arcadia. The province’s mountains and sparse population of shepherds later caused the word Arcadia to develop into a poetic byword for an idyllic vision of unspoiled wilderness. The inhabitants were often regarded as having continued to live after the manner of the Golden Age, living close to nature, uncorrupted by civilization, and virtuous. In an Utopian vision, Arcadia is associated with bountiful natural splendor and harmony. So it is perhaps no coincidence that cricket was first played by Flemish shepherds and weavers, immigrating to Surrey and Kent in the 13th century (which is now a proven fact!). Due to this, Arcadia has remained a popular artistic subject since antiquity: the Roman poet Virgil wrote a series of poems set in Arcadia, an example followed in medieval European literature (for example, Dante’s Divina Commedia). Arcadia became a symbol of pastoral simplicity, an idyllic location or paradise. The concept also figures in Renaissance mythology, especially remembered in the painting by Nicholas Poussin (1637-1638) “Et in Arcadia ego” (i.e. I once was happy). As such, cricket played on a village green in the English countryside seems a real modern time Arcadia: a day away from the noise and the hassle of the city, no stress but camaraderie on the field of play, simply enjoy the sport whatever your age or experience is. Arcadians wants to emulate this true spirit of cricket, unspoilt and open for all who like the game. The roots of cricket in Ghent go back further than we think: members of the “English colony” in Ghent registered a cricket club on 12 April 1893, the founding act of which is still in the city archives. Unfortunately, we have no other information than the founding date and the name of one member, Th. Delary-De Mulder from Ledeberg. We assume that this club did not exist for very long. from age 8 up. The club includes no less than 11 nationalities – Belgians, Britons, Indians, South-Africans, etc. Arcadians holds several quality recognitions from the City of Ghent (coaching, junior development, club structure and external communication). The club is also a member of van Cricket Vlaanderen (recognised by Bloso, the Flemish government agency for sport) and of the Belgian Cricket Federation (member of BOIC, the Belgian Olympic Committee). Cricket is a summer sport – we play matches from end April till September. Home games and practice take place at the cricket ground at Domein Claeys-Bouüaert (9030 Mariakerke, via Notenstraat), which can be reached via public transport. Arcadians plays its home games and has practice sessions at Domein Claeys-Bouüaert, between Notenstraat and Alphonse Claeys-Bouüaertlaan in Mariakerke (9030 Gent). While Arcadians played on a portable Flicx pitch during its first year of existence, the club was able to install a permanent artificial Notts Sport pitch in 2006, with the financial support of the Belgian Cricket Federation en de City of Ghent, thus improving the quality of the game. Are you interested to become a member of Arcadians Cricket Club? It does not matter whether you are a novice, or whether you have player for years. All nationalities are welcome, men as well as women, kids as well as adults. Download the form to request membership of the club here. Download the membership form, complete the form and sign it (for youth members aged under 18, a parent or guardian must sign the form). Give the completed and signed form to the membership secretary (Rakesh Kapila) or the head coach during practice. From age 12 up, new members must also provide a copy of their valid Belgian id card or residence permit. Pay the membership fee, preferably by bank transfer. Note that Arcadians does not charge match fees – the above membership fees include al costs. Payments can be made on the bank account number 068-2414975-90 of the Arcadians Cricket Club Ghent. 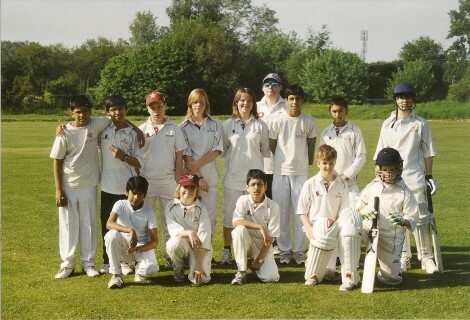 Youth cricket is the priority number one for the club. Arcadians can rely on a team of trainers with two coaches with an “ECB level 2” qualification and several junior coaches with a Level 1 degree, who teach children this entertaining, dynamic and fun sport on a weekly basis. The club welcomes boys and girls from age 8 that also want to learn the game! The club has its own youth teams since 2007 – Arcadians was only the third club in Belgium to start youth teams (since followed by others). In 2011 we will bring both an Under-13 and an Under-15 team on the field (from end April till mid July; afterwards also some friendly games). Junior games are usually played on Sunday morning. In several schools in and near Ghent Arcadians supports junior cricket for kids ages 8 to 12. These boys and girls play with “Kwik cricket”material: high-quality plastic equipment and a softer ball. This makes cricket a cheap and safe sport, where fairness is equally important. The purpose is to teach children the basic principles of the game, without some of the more complex rules. Having fun together and making everybody bat, bowl, field and catch – that’s what it is all about in cricket! The club also co-operates with the Sportdienst of the City of Ghent, organising a yearly camp “Cricket-omnisport”. All interested kids (and their parents) are invited to a free introduction practice session. 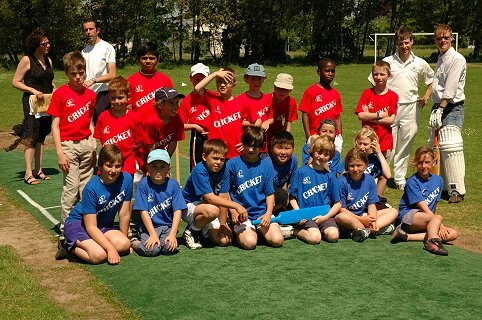 In 2005 the club established a partnership with the primary school “De Wijze Eik” in Mariakerke, aiming to introduce cricket to pupils of the 4th and 5th grade, supported by club coaches. These efforts were rewarded when the school won the First Belgian schools championship on 10 June 2009, in the presence of Christophe Peeters, alderman (schepen) for Sport of the City of Ghent. Participation in costs the club makes to rent indoor & outdoor facilities. Contribution to the purchases the club makes to allow you to play, ranging from wickets, matting, balls, etcetera to spare equipment and Kwik Cricket material to allow novices and kids to join. We are waiting for the testimonials from the ACCG members!